According to Office of Information and Regulatory Affairs data, the administration has achieved $33 billion in net regulatory savings since taking office. Regulation is a political spoils system by which various special interests impose their will on the public and profit from government favor. 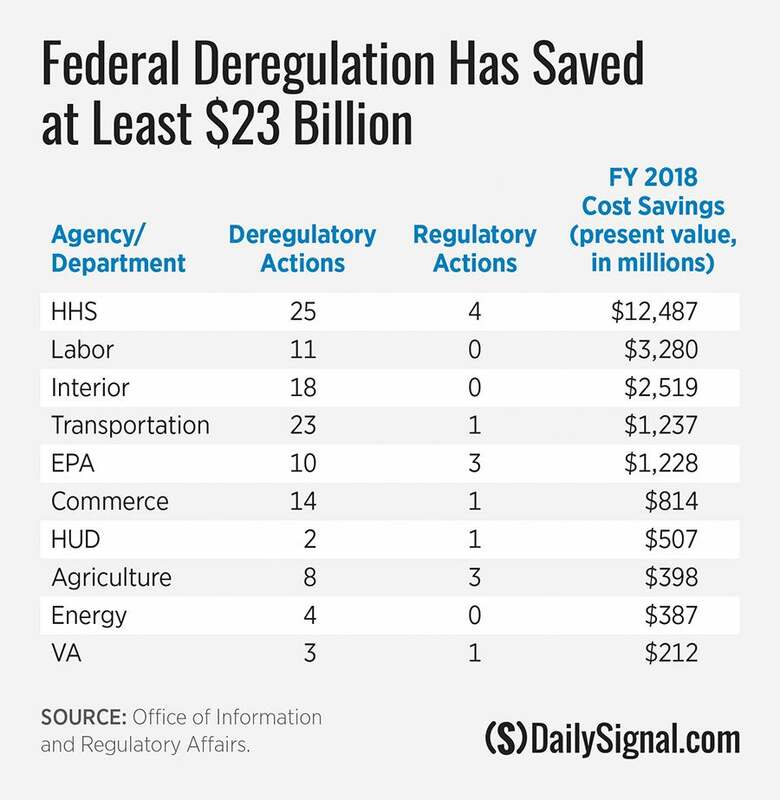 The Trump administration on Wednesday reported $23 billion in savings from 176 deregulatory actions in fiscal year 2018. Even more consequential, the administration has issued 65 percent fewer “significant” rules—those with costs that exceed $100 million a year—than the Obama administration, and 51 percent fewer than the Bush administration, after 22 months in office. Ten days after taking office, he issued Executive Order 13771, which requires agencies to offset the cost of any new significant regulation (or guidance) with at least two deregulatory actions. The executive order also established a regulatory budgeting system under which the Office of Management and Budget assigns to agencies a cap on the amount of “incremental costs” that will be allowed for the fiscal year. The Office of Information and Regulatory Affairs projects that the fiscal year 2019 caps will reduce regulatory costs, on net, by $18 billion (in present value). In addition, the administration has proposed a range of options for revising the Corporate Average Fuel Economy Standards and greenhouse gas emissions standards that are projected to save between $120 and $340 billion. And other deregulatory actions are in process, including a rollback of the Obama administration’s signature global warming regime. 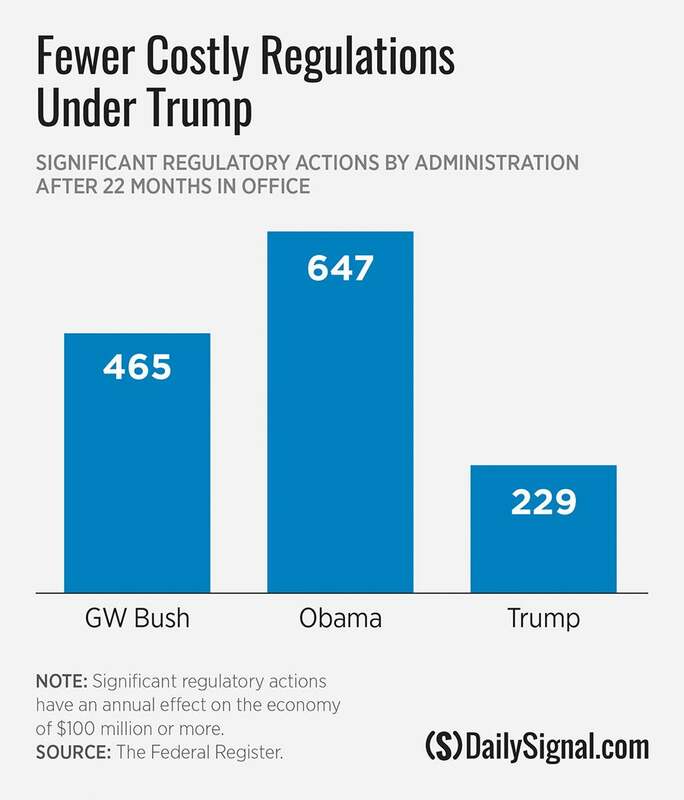 To put that in perspective, annual regulatory costs under the Obama administration increased by $122 billion, according to analyses by The Heritage Foundation. The regulatory budgeting established in Trump’s Executive Order 13771 is intended to inject a modicum of economic discipline into rulemaking. If agencies are compelled to restrict the costs imposed on the public, they must engage in a type of rolling retrospective review of the vast accumulation of rules that comprise more than 185,000 pages in the Code of Federal Regulation—up from some 138,000 in 2000. Under guidance from the Office of Management and Budget, only “significant” regulatory actions (rules and guidance documents) count toward the cap. However, offsetting costs may be derived from a broader set of deregulatory actions that would result in a net savings, including rules and guidance; streamlined record-keeping and reporting requirements; and some actions related to international regulatory cooperation. Most independent agencies such as the Securities and Exchange Commission and the Consumer Financial Protection Bureau are not subject to Executive Order 13771 despite the fact that they impose enormous regulatory costs on the public. As the table below indicates, the Department of Health and Human Services accounted for the largest regulation-related savings for fiscal year 2018. Allowing small businesses and sole proprietors to join together as associations to purchase health care coverage for employees—a cost-savings measure that had been prohibited under Obamacare. Opening large areas off the coast of New England to commercial sea scallop harvesting, and increasing flexibility for sustainable catches of bluefin tuna and shark. Reducing red tape for skilled nursing facilities, hospitals, and home health care providers. Streamlining approval of applications for small-scale exports of natural gas, including liquefied natural gas, from U.S. export facilities. Expanding exemptions to the Obamacare contraceptive coverage mandate for religious beliefs. Allow bicycling on a two-mile segment of the East Shore Trail in the Rocky Mountain National Park. Setting eligibility criteria and information collection requirements for the Agricultural Trade Promotion Program, which subsidizes commodities impacted by tariffs. Initiation of procedures to determine whether to list the insular population of Hawaiian false killer whales (Pseudorca crassidens) as endangered under the Endangered Species Act. New requirements for states and other operators of public transportation systems that receive federal assistance to develop public transportation agency safety plans. Establishing the annual percentage standards for cellulosic biofuel and advanced biofuel, and total renewable fuel that apply to gasoline and diesel transportation fuel produced or imported in 2018, and for biomass-based diesel in 2019. Reporting requirements for an inventory of mercury supply, use, and trade in the United States. The requirements apply to any person who manufactures (including imports) mercury or mercury-added products, or otherwise intentionally uses mercury in a manufacturing process. The president’s authority to modify regulation is limited. The White House cannot countermand regulatory directives from Congress, although the president appoints agency heads who exercise some latitude in rulemaking priorities. The president can also guide agency action through executive orders, guidance documents, and budgeting, as he has done. But reform is hindered by the immensity, complexity, and lethargy of the federal regulatory apparatus. A regulatory repeal requires adhering to administrative procedures, such as analyzing alternatives and presenting justification for public notice and comment. Litigation is rampant and protracted. Ultimately, however, reform is difficult because powerful forces favor the status quo. Regulation is a political spoils system by which various special interests impose their will on the public and profit from government favor. That’s what makes the Trump administration’s reforms so important. Indeed, the need for reform has never been greater.